Few months ago we launched our latest feature – customizable invoice templates, and now we’re starting our very own invoice template store. 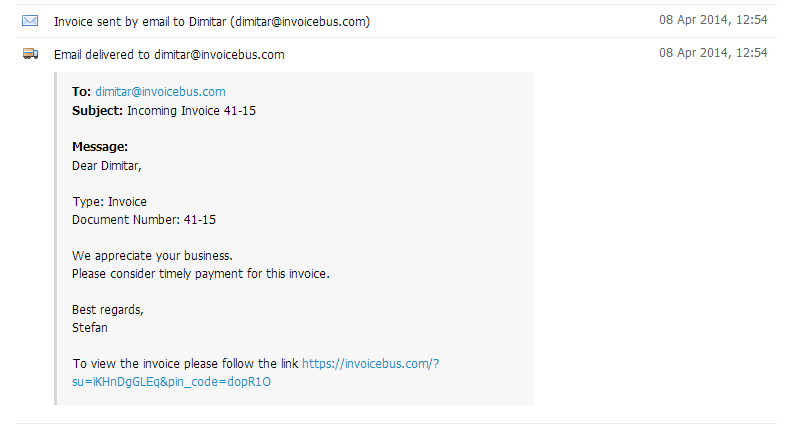 The idea for custom invoice templates in Invoicebus was on our minds even from the early days. We wanted to make Invoicebus in a way that everyone will be able to customize their invoice design and layout as they want without any limitations. Most of the time we took mental notes on how we would like such invoice templates to work but we didn’t feel comfortable to start with the realization. We knew something was missing so we let the idea distill itself and after the summer last year we finally started coding and iterating through different concepts. Few months ago we silently launched this in beta as we were still fine tuning the details. Now we believe it’s time to announce its official launch. Without hesitation we knew the templates should be made with HTML and CSS. That way they can be used in Invoicebus without converting from one format to another. We finally put to realization our collected notes and made our invoice templates framework. Some rules were also set to make sure the templates are compatible with the new version of Invoicebus. Ready to fill out and print on the fly. Can be easily customized with your own logo and colors. Support any language and currency. Auto calculate subtotals, totals, taxes, and discounts. Configurable columns, date format, and symbol position (left/right). Manipulate rows with simple drag and drop. Run directly in a browser on your local computer (PC, Mac, Linux). No setup or additional software needed. We’ve never really liked Word/Excel invoice templates as they’re pretty hard to work with. The layout can get messed-up easily and the calculations are hard to tweak with all that item rows and totals. 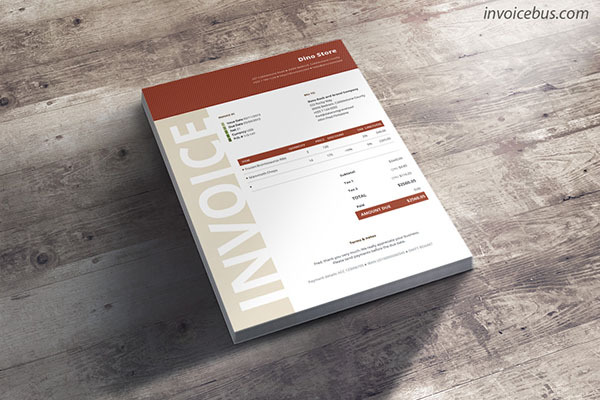 We’re pleased we can offer something new, something fresh in the invoice templates world. Actually we got so excited that we made a decision to open the technology for the invoice generator. If you’re tech savvy and know your way with web technologies you can grab the code yourself at GitHub and tweak it to your needs. 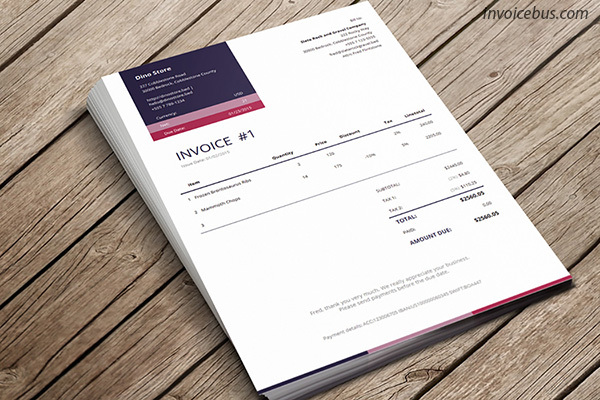 We even prepared a guide you can follow if you want to create your own invoice template. If you decide to use the script as is, no more than basic HTML & CSS knowledge is required to create your own invoice template. 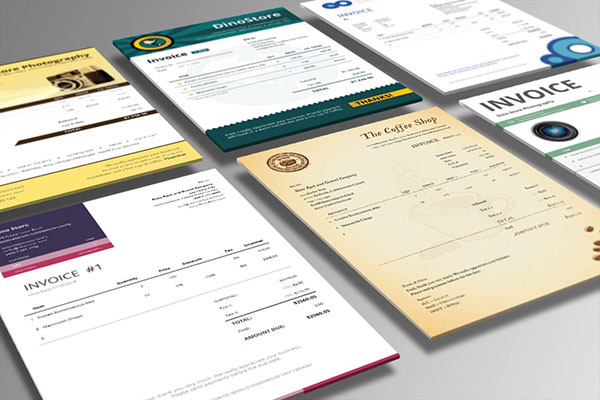 The best thing about the templates is their seamless integration with Invoicebus. You can pack your custom template in a zip file and upload it to Invoicebus, or even simpler – we embedded “Save” button that will do all the heavy-lifting for you (described at the end of the post). It’s great to know that not only your online invoices, but also the PDFs you generate will have the new invoice design you applied. Note: this is a scaled-down version for demonstration purposed only and it lacks some of the actual features. The real templates are with bigger size and are more usable. 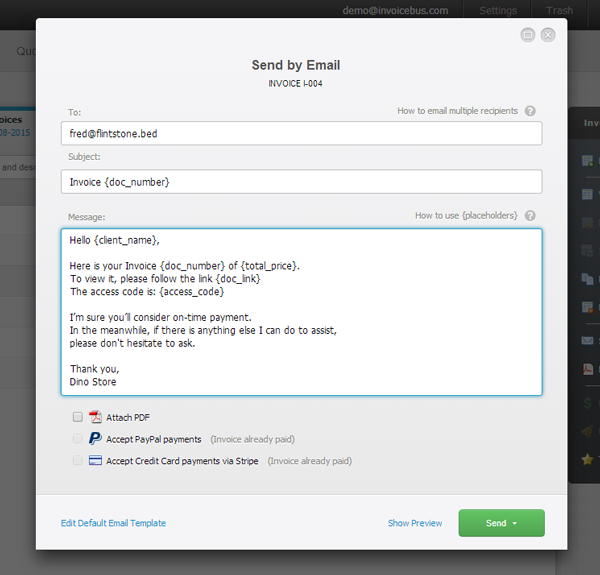 We made the template framework and the invoice generator, but we didn’t want to leave our users hanging in that state. No matter how simple and straightforward everything might seem, designing a template can be a burden and time consuming task for many people. That’s why beside the 6 basic templates already included in the bus we decided to include another 4 premium templates, all ready to use*. The icing of the cake is our newly launched Template Store, where you can browse over a dozen creative designs and choose the one closer to your brand and colors. There you can find different styles of templates – generic, corporate, retro, handwritten, etc., that will amplify your professionalism when presented to your clients. 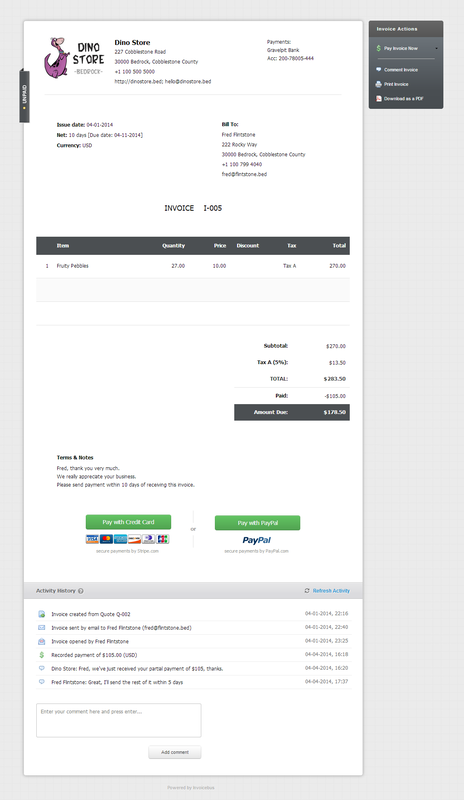 Cool thing is that you can use this invoice templates independent of Invoicebus. They are standalone and autonomous so you don’t need an Invoicebus account to create invoices with them. However, because they’re HTML/CSS based there’s no easy way to save the invoice locally on your computer. That’s why we added “Save” button that saves the invoice data and the template to Invoicebus with a single click. Of course this is completely optional and you can always print or save the invoices to PDF (with Google Chrome) for future reference. So go ahead and check out the amazing templates we have in the store. 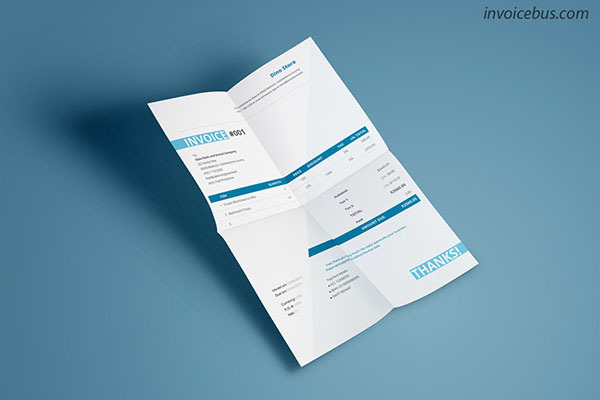 * Custom and premium invoice templates in Invoicebus are available for Single-decker and Double-decker subscription plans. The invoicing autopilot is a set of 3 features that work together to help you automate your invoicing and get paid faster. You’ve spilled blood, sweat and tears to deliver that project on time. Now it’s time to send an invoice and get your hard-earned money. It shouldn’t be a problem, right? Unfortunately, we all experience situations with late payments, forgetful clients, and tons of awkward moments all the time. The business that seemed to be pleasant can easily turn into a dreaded task. Automatic thank-you note – lets you set personalized thank-you email that is sent automatically when full payment is received / recorded. 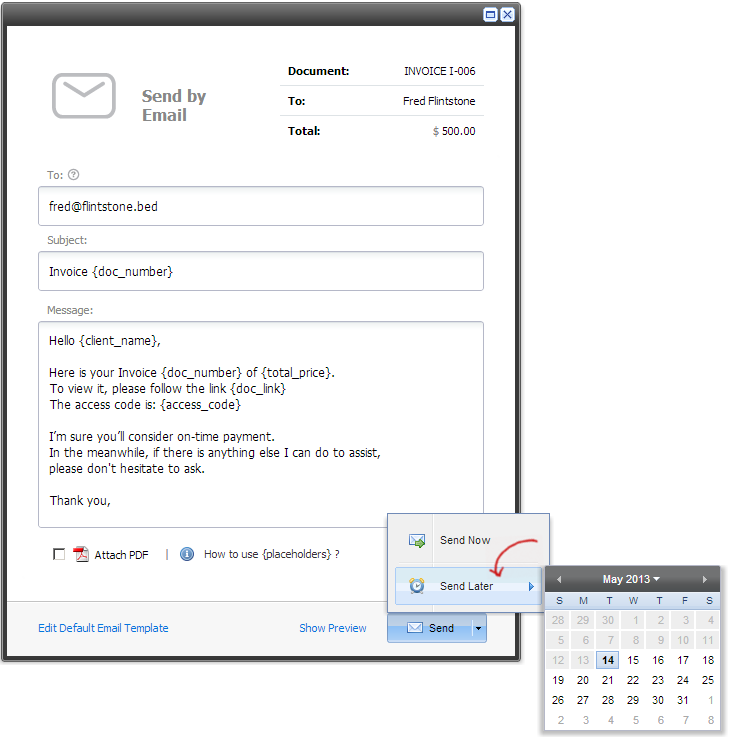 Improved dashboard – shows better overview of your outgoing emails with one glance. Export functionality – lets you download your invoice/quote list to xml, csv, or excel file so you can make custom reports. Functionality that allows you to enter custom date when you record a payment. You can learn more on these updates below. This feature should have been ready couple of months ago, but we reworked it couple of times since we weren’t exactly sure how we would like it to work. Even though this might seem like a simple functionality it turned out to be real pain in the neck. No matter what we tried, the user experience never felt right. We wanted flexibility, on the other hand flexible meant more checkboxes, more prompts, and more distraction. After tons of trade-offs we came up with something that we believe is quite simple and instantly intuitive. 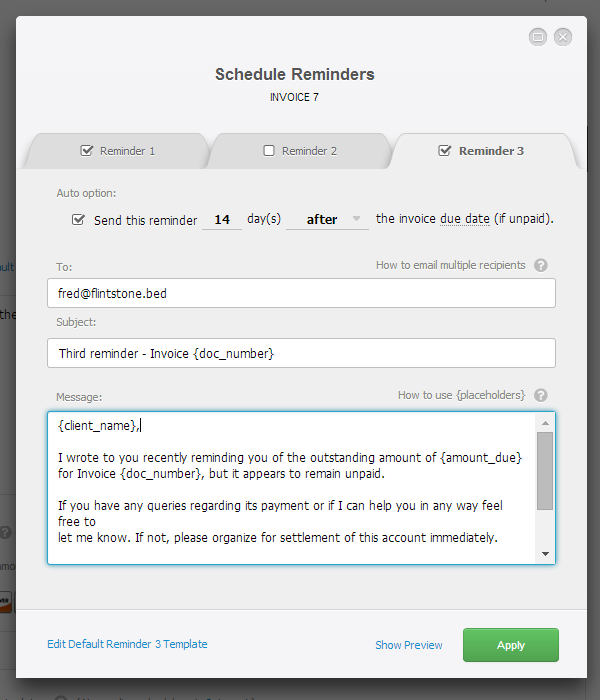 We added an option to set automatic payment reminders on-the-fly, directly from the invoice editor. This way your workflow and focus will be preserved, and you’ll never forget to set your reminders up (even if you forget, you can still schedule them later from the main menu). You can set up to 3 different reminders per invoice at a time. This way you can gradually change the tone of your language depending on the situation. 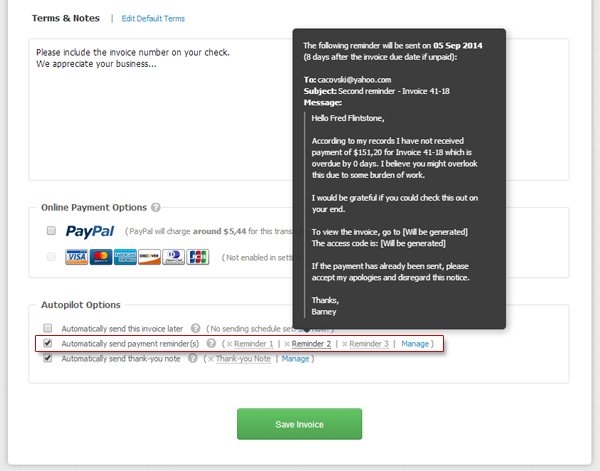 You can also save default template for each reminder and re-use it for all future invoices without hassle. Note: Invoicebus takes care to deliver your scheduled reminders during morning hours (7h – 11h), when most people tend to read their email. Implementing automatic payment reminders pulled few other changes throughout the system. We had to change the way you schedule your emails, plus we had to add few extra indicators to the dashboard. We do forget to say thanks. And we repeat this mistake quite often. Sometimes due to some burden of work, and sometimes due our own negligence. And this could be a real turn-off in building successful relationships. 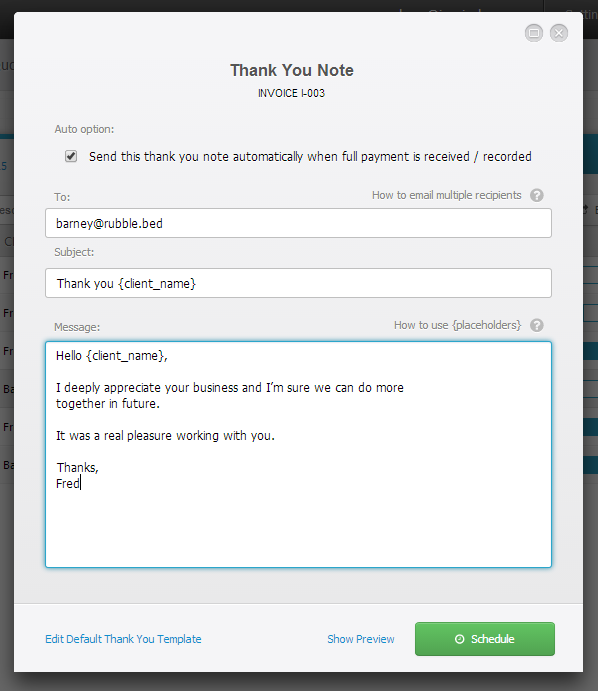 That’s why we decided to completely automate the “thanks note” task. That means, as soon as you get paid Invoicebus will automatically send personalized thank-you email to your client, signed with your name and email address. As your client will not be aware that this is an automated thank-you, you will always look super professional and grateful. Even if you don’t accept online payments, you can still set an automatic thanks note which will be sent immediately after you record a payment. Thousands of emails get lost in the cyberspace every day. If this happens, the intended recipient will never get the message and many times you both won’t be aware that the email was lost. By tracking all outgoing emails, Invoicebus makes sure this never happens. Now we improved the dashboard by including few extra indicators that will help you track every outgoing email with one glance. This will also give you a better overview of all sent/scheduled reminders as well as thanks notes. Note: Please note that all invoices sent before April 5, 2014 will only have status “sent”. This is because Invoicebus hadn’t tracked “delivered” emails before that date. Excel is a great tool which we enjoy using for creating custom reports and data charts. Even though Export-to-Excel functionality was planned for later on, we decided to push it into this update and we’re glad we did. This feature is exciting because it lets you filter your invoice/quote list and download the result set into 3 different file formats: xml, csv, and xls. The output data is beautifully formatted so you don’t need to struggle with extra formatting later on. 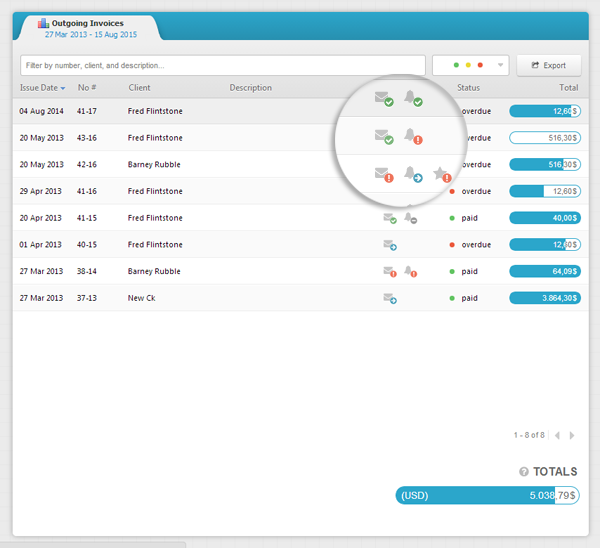 Then you can directly print it out, or make custom reports according to your needs. Even if you don’t have Excel, you can open the csv file with any text editor or spreadsheet program. Is there anything we can do to make Invoicebus better? Feel free to give me a shout in the comments below. We’ve just released a big update to Invoicebus, probably the biggest one since launch. It includes new interface design, credit card payments, Google connect, real-time email delivery notifications, and more. We believe the design is something that can make the product or break it. It’s a phenomenon that triggers immediate connection with our senses. Sometimes it may even cause various emotional responses such as happiness and joy. That’s why we give a great importance to the beauty of the graphical interface. 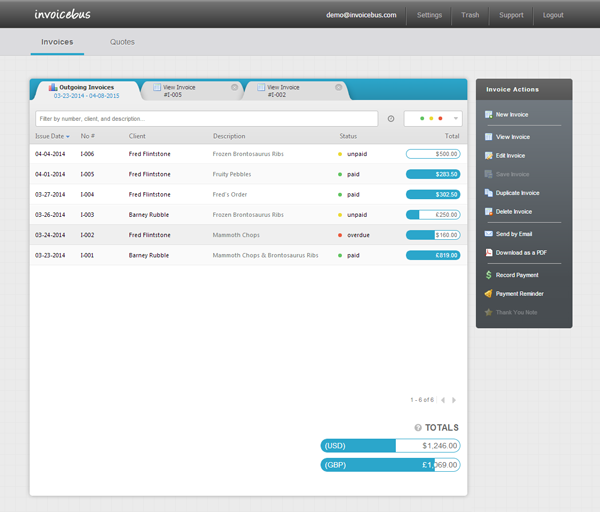 The face-lifted Invoicebus brings cleaner, refined, and more appealing appearance on top the good old user experience. Here’re couple of screen shots how the new interface looks like. We’re thrilled to announce that from now on, you can use Invoicebus to accept credit card payments instantly through your invoices, with a click of a button. To process payments on your behalf, Invoicebus uses Stripe – a great service that makes credit card payments incredibly easy and safe. If you don’t have a Stripe account yet, you may consider signing up – it’s super fast and you don’t need a merchant account. The simple payment form also allows your client to store his payment info for quick payments in future, which means he won’t be bothered to re-enter his credit card details the next time he gets an invoice from you (yay single click payments!). Furthermore, if the client has previously used Stripe checkout on any other web site, he will only be prompted to confirm the payment with a single click (Stripe already knows who the payer is only by his email address). Isn’t this awesome? 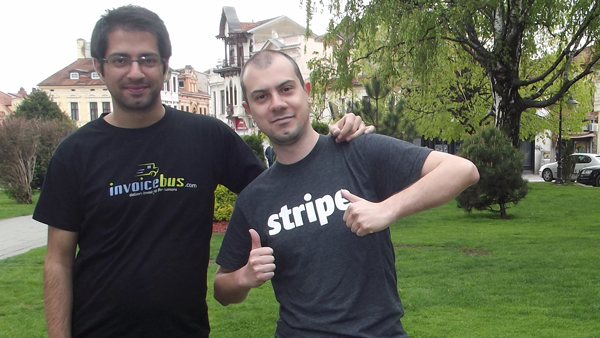 To enable credit card payments, all you need to do is connect your Stripe account with Invoicebus (Settings -> Connect with Stripe). 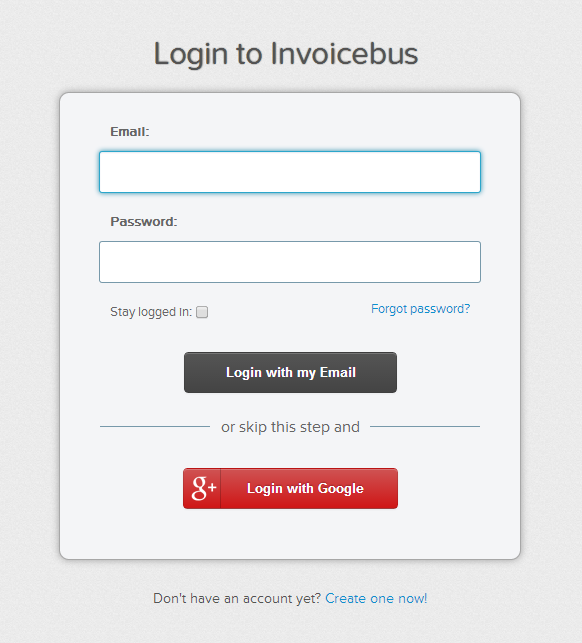 Google connect allows you to use your existing Google account to login (or sign up) at Invoicebus. If you already have an Invoicebus account with non-Google email address, you can still connect your Google account and use it for all future logins. This way you won’t need to manage separate usernames/passwords everywhere. Invoicebus deals with lots of outgoing emails per day and many times it faces situations when the email is rejected by the recipient’s email service provider due to various reasons. 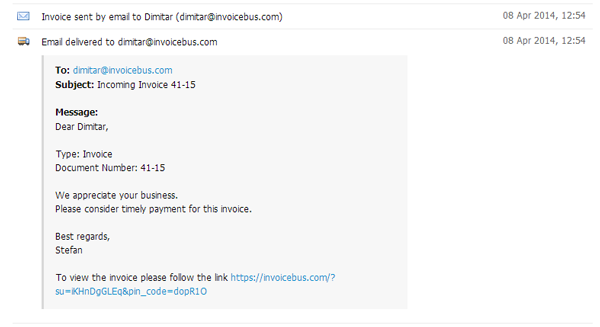 Even though Invoicebus tracks such emails (bounces) and notifies you as they happen, from now on it also tracks delivered emails. That means it tells you the exact time when your email was delivered to the client. You can track these events in real-time from the document activity history. This way you won’t need to wonder anymore if the email has been delivered or not. Added two auto-calculable fields on the invoice: “Paid amount” and “Amount due”. If you write invoices in non-English language you may consider changing the labels of these fields. Added ability to set online payment options within the invoice editor. Multiple text filters in the dashboards are simplified and combined into one field (all keywords can be entered in one sentence). 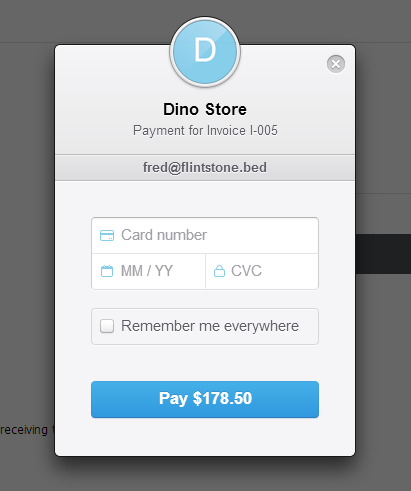 “Pay” button(s) are added below Amount Due in the client’s preview of the invoice. This will make them better noticeable to the client. “Accept” and “Decline” buttons are added below total price in the client’s preview of the quote. The “Accept” button now triggers action with a single click (no more annoying confirmation for the client). As you may have noticed, we are moving towards complete automation of the invoicing. That means we’re taking Invoicebus to a level where it will do many tasks for you, automatically – from sending quotes, to converting them to invoices, to following-up, to saying thanks to your clients when you get paid. How do you like the latest changes? Is there anything we could do to make Invoicebus better for you? Please let me know in the comments below, I would really love to hear from you. 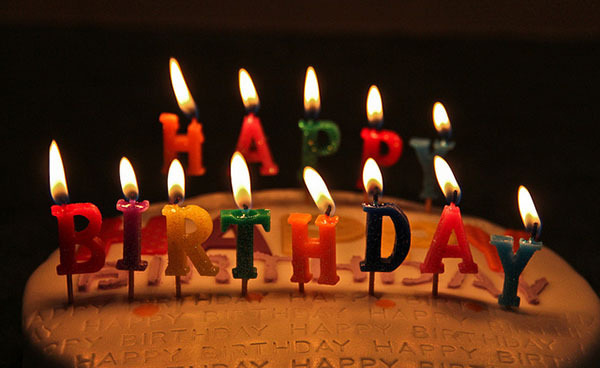 Hurray everyone, it’s our second birthday. Another great year for Invoicebus has passed since our launch in 2011 and I have not much to say other than we’re proud of ourselves and happy to be in company of such great customers. Yes, first of all I want to thank you, our dear users; because of you and your support we’re still here, giving our best to bring to you this awesome invoicing tool. I don’t want to get in great details, and the story of how everything begun is “documented” here on this blog, so just look through our archives I’m sure you’ll find interesting posts. By the way if you want to know how we celebrated our first birthday you can look here. I have to say although we’re still so young (only 2 years old) we matured a lot during this past year. We’re still riding the roller-coaster with lots of ups and downs, but we for sure learned a lot about running and growing a business during the last year. I’m not saying we’re gurus at what we do or what we achieved so far but I can assure you we’re absolutely dedicated to Invoicebus and I can assure you that we’re going to be here for a long, long time. We have a lot of plans for the future, and we’re preparing a lot of great things for Invoicebus in the following year. So without further ado, Happy Birthday Invoicebus! Starting on October 22nd at 10:00 PM CST, Rackspace, our hosting service provider will perform maintenance on its networking infrastructure of our Next Gen Cloud Servers in Chicago (ORD) region. This maintenance will expand the capabilities and improve the performance and reliability of our core network. During this maintenance, your connectivity to Invoicebus could be interrupted two or more times, for a period ranging from a few seconds up to 30 minutes. We apologize for the inconvenience. We always strive to have no-downtime associated with deploys of upgrades, but some maintenances require small delays in network traffic while the process completes. If you have any questions or concerns regarding this maintenance, please do not hesitate to contact us. From now on you can connect your PayPal account with Invoicebus and start collecting payments with just a few clicks – directly on your invoices. We’re very excited to announce this super handy feature which helps you get paid faster and easier than ever. By connecting your PayPal account with Invoicebus, a special “Pay with PayPal” button will appear on your online invoices so your clients can pay you directly with just a few clicks. Connecting your PayPal account is very easy – just go to your account settings (see image below), enter your PayPal email address and… Voila! Note: By leaving this field blank, the payments will be disabled and the button will be hidden. 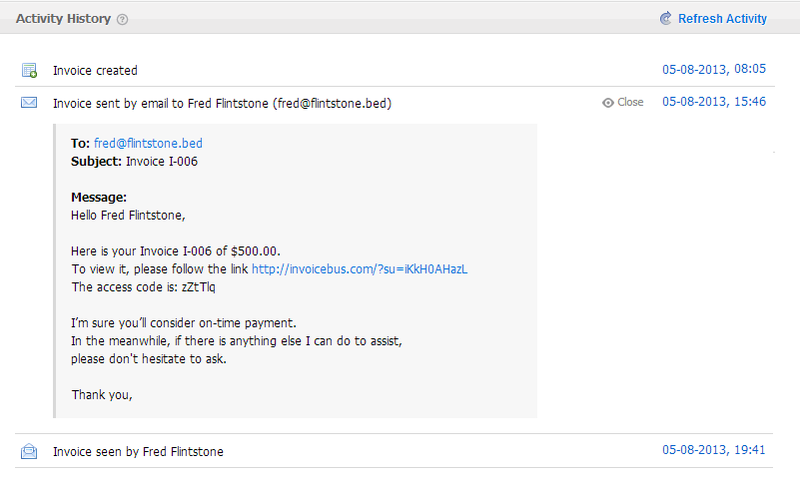 The great thing is that Invoicebus will notify you immediately after your client sends you a payment. Plus it will automatically record the payment into your account, so you won’t need to do anything. Actually you may drink a mug of beer instead. Cheers! Another exciting feature that is coming soon is the Stripe integration – it helps you accept credit cards instantly with a single click. You may think of it like you have a credit card processor integrated on your invoices. Yes, it’s that awesome. We hope you’ll find this features useful since we really want you to get paid faster. We’ll give our best to help you accomplish that. Have some suggestions for us? Shoot them in the comments below, would definitely love to hear some. Create more invoices in one day and Invoicebus will automatically send them through the month for you. We thought it would be great if you could create more invoices in one day and automatically send them later on a predefined date in future. This way you’ll save tons of time because you won’t need to login every time when your invoices should be sent out + you can make sure the client always gets your invoice at the right date. The scheduled emails are sent out during morning hours 7 a.m – 11 a.m (your local time), when the chances your message to be seen are highest. Upon sending, we send you appropriate notification. You can cancel or preview each scheduled email from the Invoice Activity History. All scheduled emails are marked with a small clock icon in the dashboard, so you can easily find/sort them. This option is available for Quotes as well. We know how frustrating can be when you can’t find an email you’ve sent, so we implemented an option for you to preview all sent messages directly from the Invoice Activity History. Of course, this way you can preview all sent reminders and thanks notes + all emails that are scheduled for sending. Even though Invoicebus guarantees 100% deliverability of your emails (all emails are anti-spam signed and verified) , many times errors occur during email delivery due to various reasons beyond our control such as typos in the email address, remote provider firewalls, remote server outages etc. That’s why we implemented Bounce Notifications – notifications that are sent to you when some of your emails are not properly delivered to the final recipient. Bounce occurs when Invoicebus detects that your email cannot be delivered after couple of attempts. Then we send you a bounce notification email (similar to those which Gmail sends when your message is not delivered) and put a record in the Invoice Activity History with all details about the problem and possible solution. I hope you’ll find these features useful. Thanks for using Invoicebus. Feel free to drop some in the comments below, would really love to hear from you. 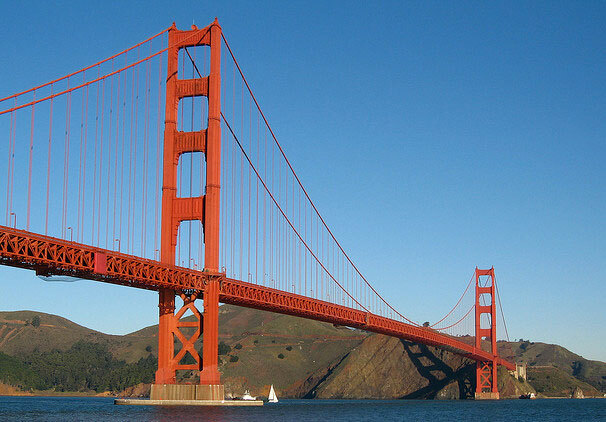 In running an online business building bridges with your users is a great thing, but you have to make sure it’s a two way bridge, otherwise it’s pointless. Before we moved to our new payment processor 2Checkout we researched which payment processor could provide us the value we’re looking for. After some googling we found a tons of companies, some well-known and others minor players in that market. Although we already chose 2Checkout because it offered the best deal for us at the time, we stumbled upon one very interesting service, so I decided to give it a try and signed up. They’re young startup, and I liked this service form the beginning, everything was so simple and user friendly, but unfortunately it was available only for US and Canadian based businesses, and because we’re located in Europe it was out of our reach. Everything went fine, great first impressions, and after couple of days I started receiving emails from the founder asking me why I haven’t activated my account, and offering his help if I needed something related with my account. Although I knew this is an automated message I respected their time and dedication, so I replied with an explanation of the whole international thing, and asked him some other questions I was interested in. I know how founders busy can be (I’m founder myself) so I didn’t expect immediate reply. But something unexpected happen, there was no reply on that email, instead I received email “disconnected” from the first one, again with instructions how I can start with collecting payments in just 60 seconds. I knew this was another automated message, and I wasn’t so surprised, as this message automation is known tactic for user engagement and communication. So I said to myself “OK, not a big deal, probably he didn’t saw my first reply”, and I practically copy-pasted my previous reply. What was encouraging in this message was the statement that his email address is for real and I should “feel free to respond to this email”, and he would “love to hear from me”. Finally I bravely hit the send button. And… his reply was …(cricket sound)… you can guess it, nothing. But don’t worry their automated emails had no problem finding my inbox. So again in the third email he offered his help, and again stated that this message was send from real email address to which I can respond to. Yeah right, I’m not going to bite this time. My reply this time was somewhat harsh stating my two previous emails and the bad communication policy they’re doing. I don’t know why I bothered sending the last email, knowing from experience that it’s probably a waste of time. And “surprisingly” it was a waste of time, but I received fourth and last automated email from him, asking me for feedback, in which I briefly stated that they don’t accept international merchants. With that, all their unsuccessful user engagement finished. I don’t want to sound too critical and I’m not going to tell people how they should run their business and what’s best for their business, but some of them should really start to care for their users even the one using their system for free. Let me tell you this, because of our one-on-one live support which you get only with our invoicing service Invoicebus we managed to fix critical bugs, and added super features, all in all we brought Invoicebus at a greater level. If you’re planning to engage your users with email messages, and offering help or even leave your phone number (I’ve noticed some CEOs do this) you should expect some of your users, to actually reply or even call your phone in case you provided one. So if you’re on the other side running a business, my suggestion for you is to reply on the emails and take the calls. You’ll be surprised how well people will react if you assure them there is another human being behind all that pixels on the screen. I can’t emphasize enough how important this is in the world of the online services. 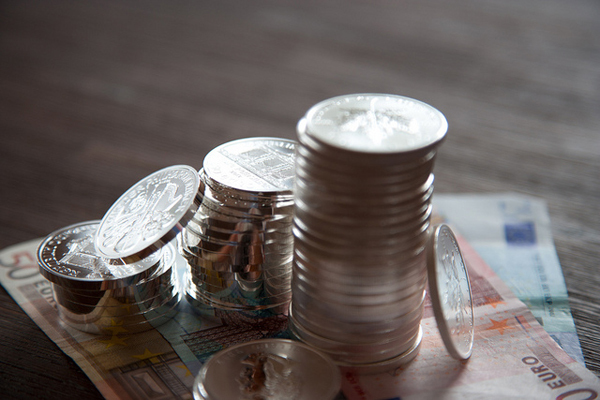 If we ever disappoint you – get double your money back. No catches. Seriously. We believe in Invoicebus so passionately that we’ve decided to take all the risk onto our backs and make sure you take none. 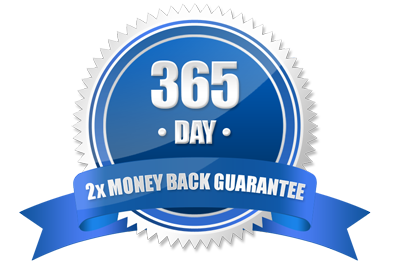 We’re super excited to introduce the iron-clad, 365-day double-your-money-back guarantee with no catches. If at any time in the first 365 days you feel that we did not live up to our promises and you choose to leave us, we’ll pay you back DOUBLE what you’ve paid us up to the point when you cancel – no questions asked! We’ve never offered this kind of ridiculous guarantee before, and we wouldn’t offer this if we weren’t 100% confident in our product. You signup with us, kick the tires and pick one of our paying plans. You decide Invoicebus is not for you. You cancel your account with us within the first 365 days. You claim your Double Money Back Guarantee. The updated refund policy takes effect immediately. Beside the money-back guarantee, we decided to give you the opportunity to subscribe for longer period on any plan and get reasonable discount in return. Don’t forget that whatever period you choose, you’ll be protected by our rock-solid money back guarantee up to 365 days. Suggestions? Feel free to put some in the comments below. In the past 14 months we were using Skrill as official payment processor, but it turned out to be real pain in the neck, so finally we’re saying goodbye. From now on, all new paying subscriptions for Invoicebus will be processed by 2Checkout.com, Inc (Ohio, USA), which is authorized retailer for thousands of tangible or digital products and services worldwide. When you’re purchasing plan at Invoicebus website, you will be taken to the secure site of 2Checkout.com and brought back to Invoicebus upon completion of your order. You will receive clean and short receipts by email each month. The existing paying customers will not be affected by this change. However, during the next 90 days, they will be asked to update their payment method voluntarily. Garage is a blog that gives you a glimpse behind the scenes of how we build and run Invoicebus. We also use it as spot to share ideas, lessons, and tricks we learn during our startup journey.